This coffee is AMAZING. I bought it from Amazon, but decided to visit the original site. And it’s way more affordable here! I’ve let so many people try it and we all love it. I tried to give it five stars but for some reason my computer isn’t letting me. So, FIVE STARS!! Love it! Love it! love it! and so disappointed I can’t find it in any stores any more!! I never leave reviews for anything, but this coffee is so amazing that I feel the need to let people know what they are missing out on! I’ve been a barista for over 8 years, and have yet to try a coffee this good. I want to give this 5 stars my phone won’t let me either. I have loved all of you coffee I have tried. I love the breakfast blend, but most favorite is the Blueberry cobble. I love anything with blueberries and when I saw it, it was a must try. And honestly it was live at first sip. The best thing about your coffees are that they never leave a bitter taste, plus the pricing in our area is remarkable. Please don’t ever stop making this blend! THIS DESERVES 5 STARS, but it will not let me choose that! Hands down, THE BEST tasting coffee both my husband and I have EVER HAD IN OUR ENTIRE LIVES! PERIOD! Love this coffee. Found blueberry coffee through green mountain k cups but I have to say this is much more affordable and taste better! This is Awesome!! The smell of this brewing is HEAVEN!! It really tastes like blueberries. When I carry this with me in a mug people ask me what I’m drinking because it smells so GREAT!! Yummy!! My husband and I LOVE Blueberry Cobbler. We’ve been drinking it for years and like no other flavors better. Recently, however, we can’t find it in stores any more. VERY DISCOURAGING!!! We’ve gotten several friends loving it over the years, only now not to be able to find it. Please don’t discontinue the flavor!!!!! This is the coffee that finally convinced me that I am a coffee drinker. It is wonderful… thoroughly recommended! LOVE this coffee. It is getting harder to find however. So I will continue to order it here. Drink if every day. I use a single serve brewing machine and add about 6-8 blueberries to my mug. Gives it just a little extra flavor and seems to make the coffee even smoother than it already is. I’m a fan! my favorite coffee!!! love the aroma and the taste!!! perfection!!! Smells absolutely amazing and also tastes fantastic. Great breakfast coffee with the strong blueberry flavor. I’ll most definitely reorder. I love blueberry coffee, and this brand has the best I have tried! Absolutely my favorite coffee treat! If I cannot find it on the shelf, I leave the store in search of it somewhere else! It has no rival. Happily I can find this at my Publix store in Florida. When I move back to Chicago IT BETTER BE AVAILABLE! You can actually smell blueberries when it’s brewing and has a lovely, smooth taste. Need to stock up. I have been buying the blueberry coffee of yours for years. We love it and drink it everyday. I live in SC and the Publix did carry it. They just stopped carrying the blueberry, and I am so unhappy. I wanted to make sure you were still making it. Please continue! It is our favorite. While the stores here carry some of your products, I will have to try to see if they can order the blueberry for me. We love, love, love this coffee it is our favorite! Blueberry is our favorite! We bring it on every vacation we travel and it now signifys adventure. When we break it out at home it’s connected to amazing memories. I think I’ve tried every blueberry coffee and this one is by far the best out there. Once you try it your hooked! Best coffee ever!!! Blueberry Cobbler rocks my world!!! My absolute favorite coffee! For some strange reason they are discontinuing New England coffee at the local Winn-Dixie. I went in and bought the last 7 bags at the store this morning. Will be ordering from here in the future. Thanks for great coffee!! Most amazing coffee ever. I bought some of this while on vacation in New England and loved it from the first minute of brewing. Flavor is a great blend without an overwhelming flavor but just the right amount of blueberry and coffee for a smooth and sweet taste. I am addicted. I’ve recommended this coffee to so many people. All of my friends love it. I need to stop raving about it because it’s always sold out at my local grocery store!! Ok so I hadn’t had coffee in almost one year so I wanted to have some to keep me awake so I tried this and let me tell you I couldn’t believe how good it tasted I think I’ll be having a cup a day now. Also I don’t put any sugar or creamer in my coffee because it’s not good for your health and I’m all about my health so I didn’t put any sugar or creamer in it it was just natural and it tasted amazing I sat in my room read a book and drank my coffee and it was sooo relaxing! Just purchased this and love it! What a smooth and refreshing brew! The blueberry really comes through! I would highly recommend this brand and this flavor!!! The Chocolate cappuccino is very good as well! Amazing smell when brewing and a great after dinner treat with a little French vanilla creamer! Truly our morning coffee standard! We discovered this coffee a few months ago and it hasn’t left our coffe pot since! It is a great blueberry taste and aroma. It is also a smooth and full body experience. Although it is hard to find in stores….I will be ordering several bags from this site. Lol. worth 6stars in my opinion! This is my all-time favorite. I’ve loved it for years. The ground coffee is great, but if you have a grinder, buy the whole bean. I get fresh tasting coffee every morning. My grocery store has discontinued this flavor, but Wal-Mart still carries it & it’s very inexpensive. The website is the only place to get the whole bean, so I order from here often. LOVE this Blueberry Cobbler! I’m a very picky about my coffee and this is perfect. not bitter and not a weak cup of coffee either. As for the flavor, it’s not overpowering or fake. Just the right amount of blueberry cobbler. I drank it black at first and added non dairy creamer which brought out the flavor even more. This will definitely be a repurchase! I got this first bag from Amazon but will try this site next time. Now that I know how good this flavor is, I might try other flavors by New England Coffee. Love the coffee, but wish it could be made using only natural blueberry flavor. Why does it need artificial flavoring added in? I found this coffee a decade ago stationed in Kittery. It was like finding my soulmate. This flavored coffee is Amazing-Rich in flavor and its aroma has a powerful aroma! 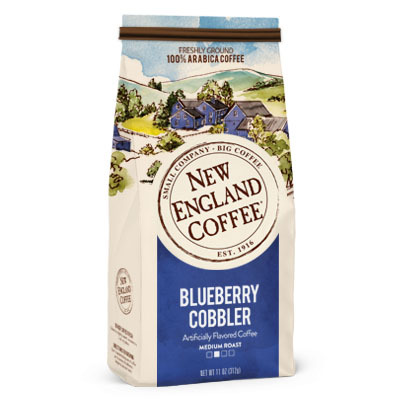 I look forward to my morning coffee routine every morning-blueberry cobbler by New England Coffee never disappoints!! My boyfriend and I tried this coffee before any of the other flavors, at a gas station in Indiana. We had to get some for home! Ever since we’ve consistently bought more and have tried new flavors by New England Coffee. It has really expanded our interest for coffee! I love this flavor! My local supermarket sells it and I’m never without. It’s fragrant and delicious hot or iced. Blueberry Cobbler is my favorite coffee now. It’s smooth without that bitter after taste that comes from beans that are over roasted which seems to be popular at those high priced coffee shops. This has the proper essence of blueberry without being to fruity. I add a touch of organic stevia and organic cinnamon to it 1-2 times each day. After my local Walmart stopped carrying this I went online and stocked up. Please never stop making this flavor! I love this coffee. I have loved all the flavors I have tried from New England coffee . This is by far the best tasting blueberry coffee I have ever had. Dont change your coffees they are fantastic!!!! I am not a great fan of coffee, but your blueberry is great. Hard to get at our primary residence, but when we visit our vacation home we stock up as the local Walmart stocks it. 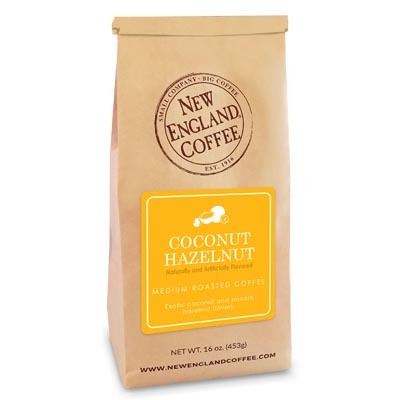 New England Coffee has the BEST flavored coffee you will ever, ever taste! This blueberry is spot on tasting like blue berry.